Since 1987, the Kalahari Vasbyt has made a difference in the lives of many young men. The course is physically and spiritually demanding. The scientific basis on which the Vasbyt is built ensures that you learn discipline and become physically fit without being humiliated or degraded in any way. Without a doubt, it will be the best holiday of your life. Nothing will be required of you which the tour leaders are not prepared to do themselves. The Kalahari Vasbyt is a subsidized course. Donations of R100 000 make the course possible. Funds are transparently utilized and all funds which are paid by you (as well as from our sponsors) are used for the benefit of the tour. We believe that young men who dream of making a difference in the world will benefit by taking part in this course. In addition, the Kalahari Vasbyt will give you a start in life which would otherwise be difficult to achieve. 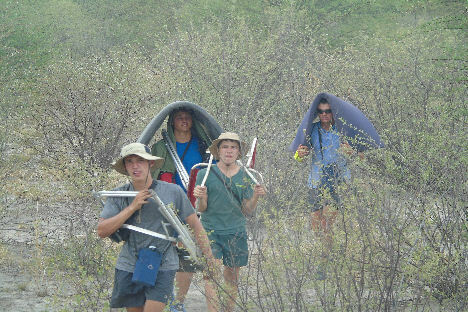 The Kalahari Vasbyt is without a doubt one of the most difficult, if not the most difficult, physical and emotional course which any teenager anywhere in the world can do. If you endure, you will always be proud of having completed the course and it will certainly make a difference in your life. Our course kicks off on 29 December 2019 at 09h00 at the O.R. Tambo International Airport in Johannesburg. This means you will still be able to enjoy Christmas with your family and friends. We will fly with British Airways to Victoria Falls before visiting the Okavango Delta and Maun. Then comes the great adventure of the Central Kalahari. The Central Kalahari is undoubtedly the wildest area that you can imagine. During January, large numbers of springbok, blue wildebeest and oryx gather. The predators, such as lions, as well as the scarce brown hyena follow. (Approximately every 10 years there might be fewer animals). 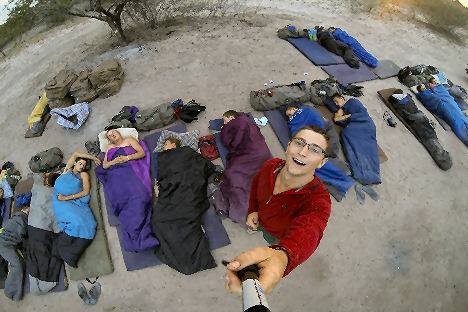 When applying for the Kalahari Vasbyt it is imperative that you agree to give your best. Only this will ensure your success. If this is not for you, we suggest that you rather stay home. You will need to be a team player and to be able to work together with others. The standard is high. We strive to be under the 1000 best in the world. Should you be required to wash a vehicle, the question is not whether the vehicle is clean or not, the question is: are there a 1000 teenagers who would be able to do it better? Should the answer be yes, you are simply not good enough. This applies to general knowledge, fitness, leadership and everything that we do. We will only be accepting entrants who are at the start of gr 10 and 11. Entrants who are matriculating in 2020 will not be accepted to ensure that they do not miss any schooling during their matric year. The cost of this course is R17 600 + US$350. 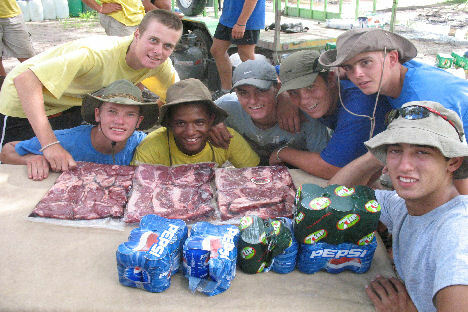 This includes all meals, transport, free time, white water rafting, bungee jumping and a visit to the Victoria Falls. These activities alone cost more than US$250 per person and are all included in the price. Entrants will not be allowed to take more than R800 “pocket money” on the Vasbyt. The Vasbyt is full of unexpected surprises. You will be extremely fit after the course. Yet, the Vasbyt is by no means a survival camp. The going will be extremely tough from time to time, but we will work extremely hard and get fit. In addition, it will be expected of you to adhere to the principles attached hereto. Strong discipline applies on the Vasbyt and you will have to stick to the rules. We do not drink or smoke on the Vasbyt; this applies to me, all the tour members as well as to all the tour leaders. We suffer together and relax together. Adults over 40 will have a slight discount when it comes to PT. What you eat and drink is exactly the same as what the rout leaders eat and drink. If you are having a cold drink, the adults will only have their share if there is enough to go around. At mealtimes, the adults are last in line. If we should per chance have any luxuries, we will ensure that you are afforded the same. Be assured, that this is the character of the Kalahari Vasbyt. 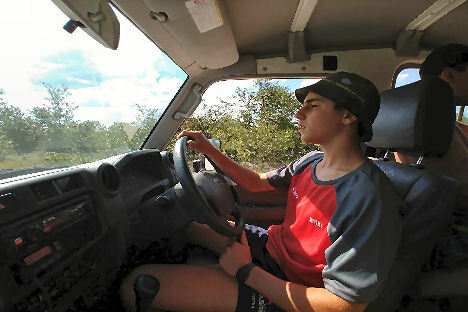 If you are a young man with character, who is adventurous, loves learning, wants to drive long distances in the veld, wants to know more about the environment and strives to achieve the very best - the Kalahari Vasbyt may be just what you have been looking for.